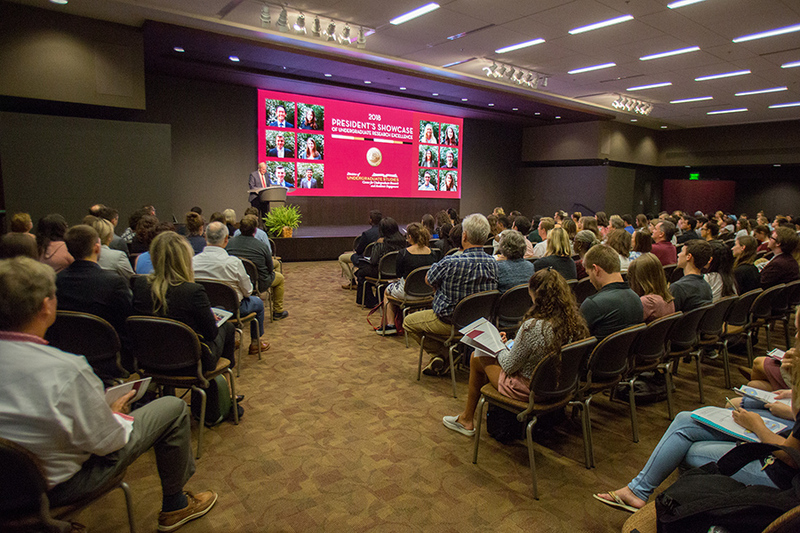 Faculty, staff and students came together to recognize the outstanding research achievements of current undergraduate students at Florida State University’s 2018 President’s Showcase of Undergraduate Research Excellence Monday, Oct. 1. 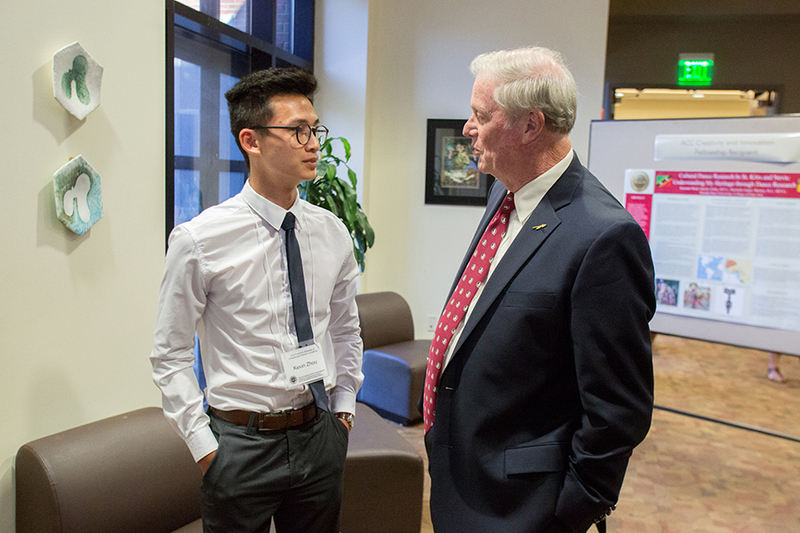 The showcase celebrates the research and creative accomplishments of IDEA grant recipients, Tech Fellows and iGEM summer award winners and allows community members to learn about the academic endeavors of FSU students. 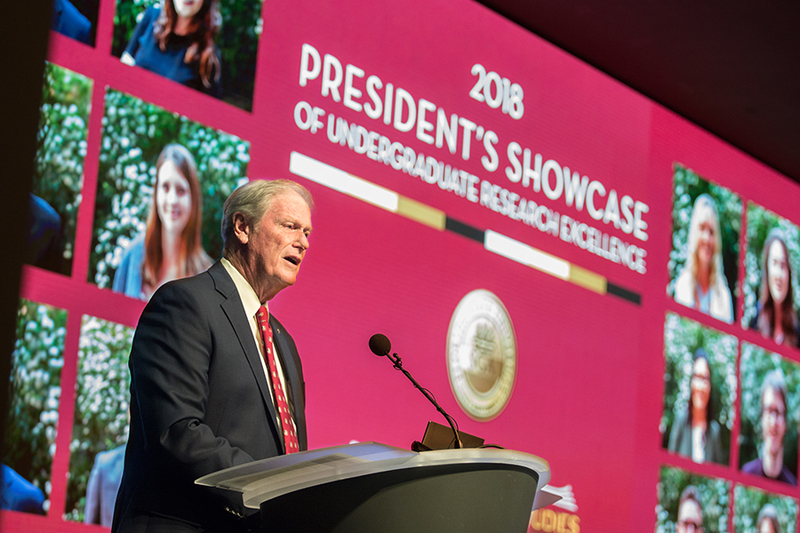 President John Thrasher applauded the hard work of the student researchers and recognized the important role of research in community and individual development. 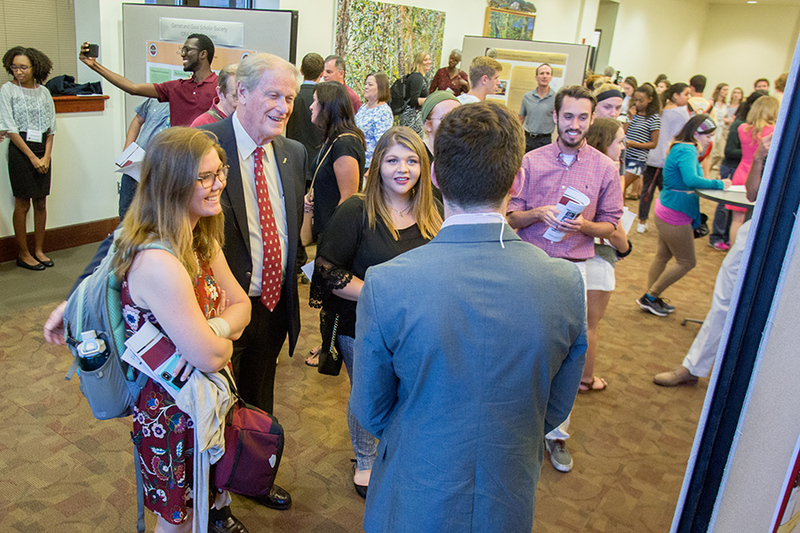 The IDEA grant is sponsored by FSU’s Office of the President and the Center for Undergraduate Research and Academic Engagement (CRE). Undergraduates of any major can apply for funding for self-designed work on a topic, project, problem, artistic product or performance, or other entrepreneurial or creative idea for awards ranging up to $6,000. 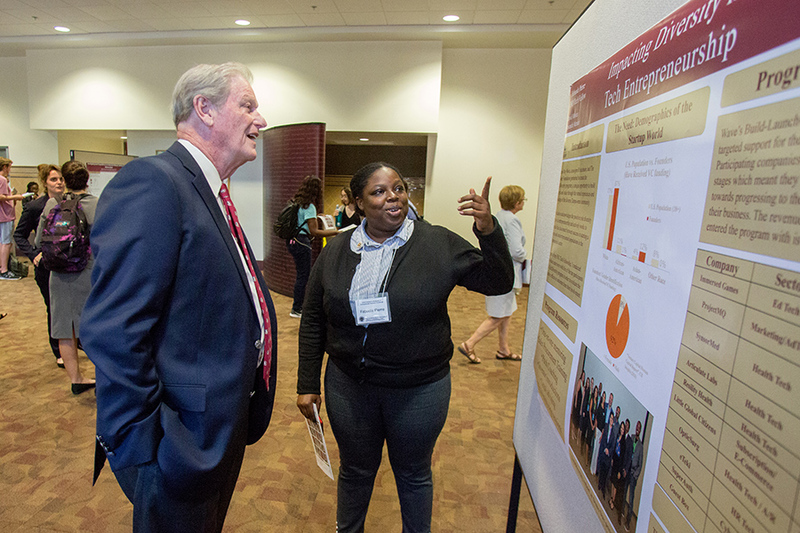 Students presented on a wide range of topics, including women’s access to healthcare in Peru, sound-activated engineered cells, the reconstruction of historic Thomasville, Georgia, and the effect of traumatic brain injury on individuals with ADHD. 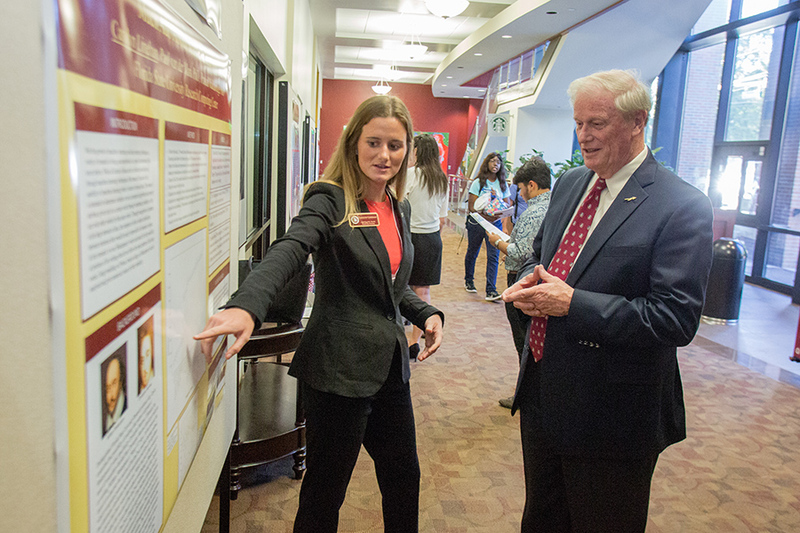 Kensie Funsch, a senior psychology major and Garnet and Gold Scholar Society IDEA grant winner, explored how social rejection affects suicide with the help of a virtual reality approach developed by her supervising professor. The IDEA grant allowed Funsch to stay in Tallahassee as a research assistant over the summer to gain data and run participants in the experiment. “I’m going to be applying to Ph.D. programs in clinical psychology, and I would’ve never realized how much I enjoy research if I hadn’t been encouraged to participate in things like the Undergraduate Research Opportunity Program and the IDEA grant,” Funsch said. Other projects, like senior creative writing major Talise Burton’s, resulted in a creative product. Burton used her IDEA grant to design a class and create a syllabus to teach entrepreneurship to creative arts majors. Burton hoped to dispel the stereotype of the “starving artist” and teach creative majors how to excel in their art and in business. 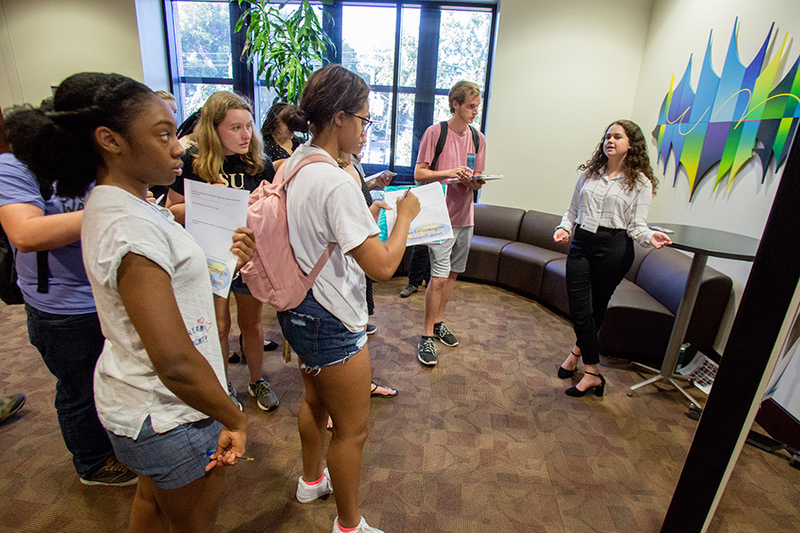 Karen Laughlin, dean of Undergraduate Studies, recognized the diversity in the projects on display and spoke to the important role and global effects of undergraduate research. Caitlyn Gillespie, a senior meteorology major and IDEA grant winner, reflected on her year of research and encouraged others to get involved as well. To learn more about the IDEA Grant, visit https://cre.fsu.edu. 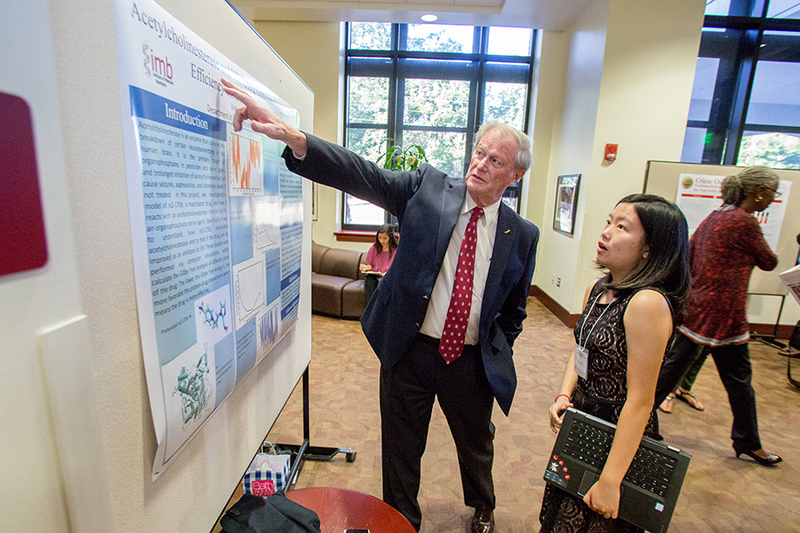 View the complete program from the 2018 President’s Showcase of Undergraduate Research Excellence here.